Our Sunday Supper team has you covered when it comes to Platter Food. When I think of platter food I think party, food, family and friends. Whether your next gathering is small or large, in home or away, fancy or casual; our list of platter food dishes will give you a ton of great ideas, suggestions and mouth watering recipes to make it easy for finding the perfect platter and party food. A few weeks ago we were invited to a birthday party for our neighbor's little girl. She had a swimming party at her grandparent's home and wanted CRABS. Not just any crabs but Maryland Blue Crabs. 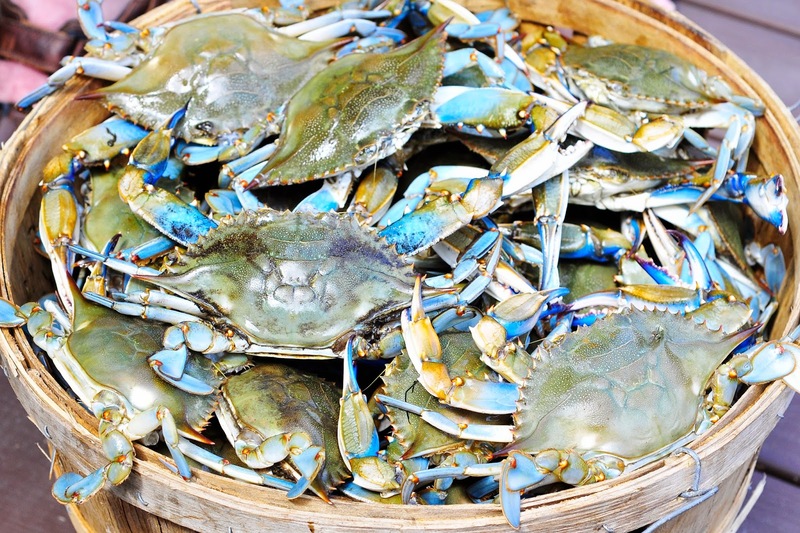 We were treated with a bushel of fresh steamed crabs. In Maryland, this is the PERFECT platter food. Along with the crabs we were served an assortment of finger foods and beautiful platter dishes. I didn't want to come empty handed and brought these Antipasto Skewers. Antipasto means "before the meal", an appetizer. We were treated to deviled eggs and a 7 layer Mexican Dip. 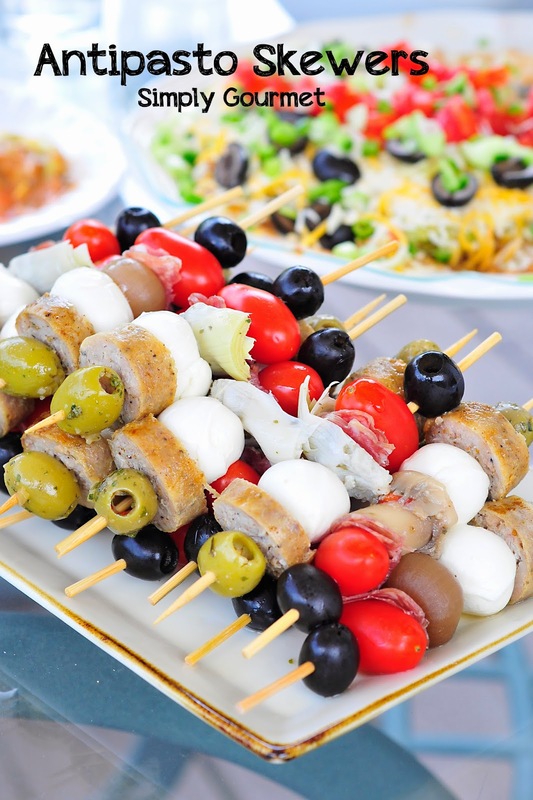 For my skewers I chose to include some of our favorite antipasto items. I love the cipollini onions that are marinated in a sweet and tangy marinade, the mushrooms that are tart and spicy with italian dressing and my all time favorite, artichoke hearts. I planned on 20 skewers so I bought enough of each of these three items to add 6 or 7 to one-third of the skewers. This gave some variety to the skewers so they were not all the same. (see top picture) To this I added some salami, mozzarella balls, tomatoes, olives and italian chicken sausage. I served the dish with my favorite pesto sauce. 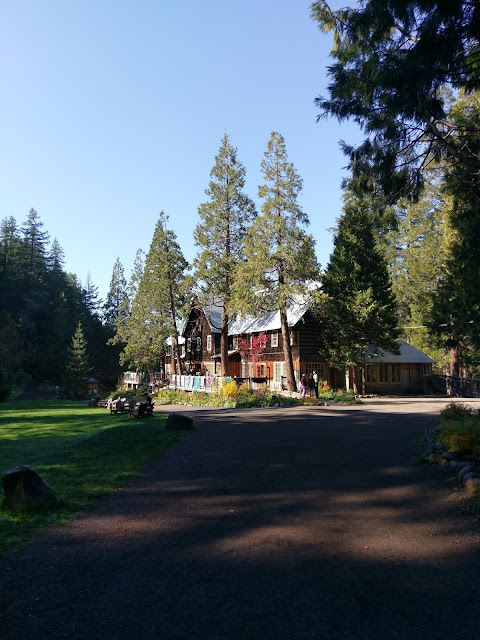 We all had a great time, our bellies were filled and wonderful memories were made. 1. Gather ingredients and skewers. Find a large platter to add skewers to. 2. Add ingredients to skewers in any order. Stack skewers on platter. I alternated the rows so that they would stack evenly otherwise your tower of skewers will lean to one side. 3. When done, cover with plastic wrap and refrigerate until ready to serve. Talk about a party on a stick! I'd stack a bunch of them on my plate. Totally yumminess. Thank Renee. I had to hold myself back at the party--LOL I wanted the whole plate. 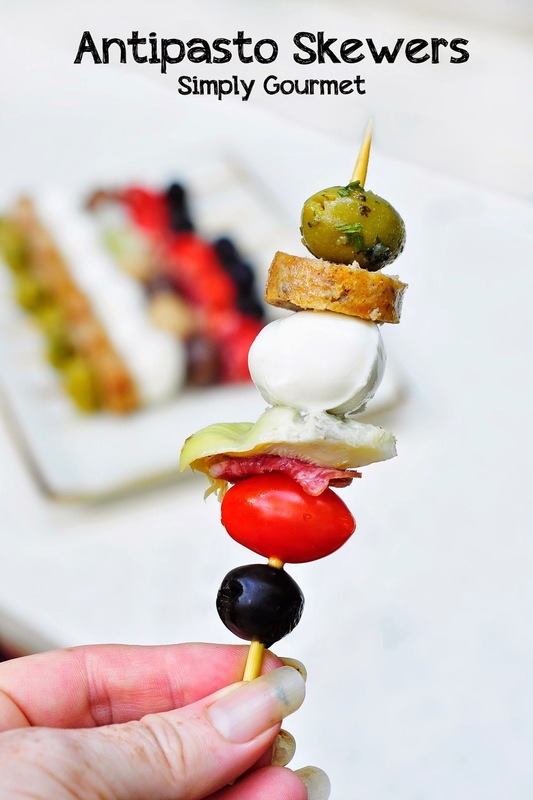 I could easily make a meal from your beautiful antipasto skewers! Perfect for any gathering! What an adorable appetizer! We love food served on skewers and I'll definitely have to try these! Thanks Jennifer. They are super easy. These are such a fun and portable appetizer, perfect for a party! Thanks Heather. You are right they were super easy to transport. I have some cipollini onions and never thought of using them this way, but what a great idea. I also love that you used chicken sausage, one of my favs! Thank you Shelby. I was trying to do something a little different than the usual antipasto skewers and tried to use ingredients we love. I love this idea and recently made some myself. Your look so delicious. That looks delicious! 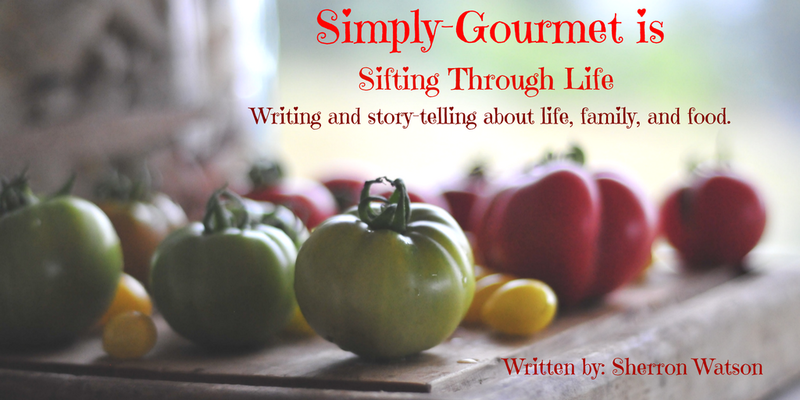 Thanks for sharing with #SundaySupper. I love these skewers, everything I love on one handy stick :) Oh and those crabs? YUM!!! I am going to make these for my Saints Football Kick-Off party next weekend. Fantastic idea, they look great on a skewer instead of laid out on a plate. Thanks Pam. I think they are super easy to eat when your hands are full with a drink. Enjoy your football party. Thanks Pam. Enjoy your game! This is the perfect party appetizer and I love that you added the sausage, you usually don't see that! Thanks Susan. I was trying to include a few things that were unique to stretch our ideas of what could be used on a stick. I love these little bites, and you can totally customize them too! This, Sherron, is simply awesome! I'd love to top it off with pesto sauce, and goodness knows I'd love to sub some vegan soy Italian sausages here as well for our parties. Thanks so much for sharing! Thank you Ala. I love pesto! I love your idea of using an Italian Sausage that fits into your diet. I love to see that. The stepfam will love this! I would eat the whole tray myself. These look so amazing!! Very creative twist on the antipasto platter (one of my favorite things ever, btw). Thanks! I love cipollini onions too, and love that you included them. What a perfect way to offer an antipasto at a party!! Skewers are always an appetizer favorite!! I love antipasto. This is a great way to serve it! These are awesome. All my favorite flavors on a stick. Well done!